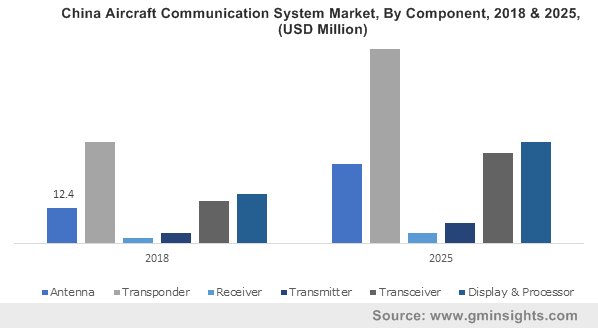 Aircraft Communication System Market size was valued at over USD 1.5 billion in 2018 and is estimated to exhibit around 7% CAGR from 2019 to 2025. Growth in the commercial airplanes owing to increasing air passenger travel is the key factor driving the aircraft communication system market growth over the study timeframe. Rising consumer spending along with increasing preference towards air travel owing to superior safety and increasing disposable income will further fuel the market demand. Airliners are engaged in introducing low-cost carriers with expanded network routes, enabling consumers to travel across multiple destinations at reduced rates. They are constantly focusing on reducing the flight rates further enhancing the passenger preference for air travel supporting the product demand. Increasing air traffic along with stringent government regulations regarding air safety will further boost industry growth. Low commodity price, strong passenger demand and stable GDP growth are the key factors stimulating the product penetration over the study timeframe. Growing affordability in middle class along with low air fares and improving tourism sector will support the aircraft communication system market by 2025. In addition, shifting inclinations for replacement of conventional communication systems in the air carriers with innovative and efficient systems is positively influencing the business generation over the study timeframe. Proliferating defense budget along with growing demand for advanced military airplanes offering improved communication systems will drive the aircraft communication system market growth over the study timeframe. Replacement of in-service and ageing air carriers with newer generation advanced models are the key trends observed in the aviation industry. Increasing defense budget requiring advanced R&D activities and higher adoption of military airplanes with advanced systems will further propel the industry demand. Additionally, superior demand for military airplanes particularly from countries including UAE, Saudi Arabia, South Korea, China, India with the purchase of advanced equipment will positively influence the aircraft communication system market share till 2025. SATCOM system market size will witness over 8% CAGR owing to increased transmission of data through applications such as Communications-on-the-Move (COTM), video streaming for Intelligence, Surveillance and Reconnaissance (ISR) and Command and Control (C2). A significant growth in telecommunications, weather monitoring and navigation systems will positively influence the aircraft communication system market size over the forecast timeframe. Increasing military demand for greater satellite communication bandwidths is providing potential opportunities further supporting the segment growth. For instance, in December 2018, Arianespace successfully launches French military Earth observation satellite CSO-1 for defense and security applications. Data link communication system will witness considerable growth owing to increasing avionics upgradation and installation of cockpit communication systems for the air carriers. Substantial growth of data connectivity, ground automation message generation and message routing and transmission systems will positively augment the segment size over the coming years. Strategic agreements and contracts with airplane manufacturers will significantly contribute towards increased revenue generation supporting the aircraft communication system market share by 2025. For instance, in September 2016, Spectralux Avionics entered into an agreement with Boeing Intellectual Property Licensing Company for providing data link communication systems for Boeing 737, 757, and 767 airplanes. Transmitter segment will witness over 6.5% growth owing to the operations offered by this component including transmission of superior signal strength travelling over large distance. Industry players are developing innovative transmitters offering precise frequency and enhanced signal strength, enhancing the aircraft communication system market demand in the forecast timeframe. Lowering of overall weight and complexity of the transmitter are the key focus areas of the manufactures that will support the industry proliferation by 2025. Transponder segment dominates the aircraft communication system market size with its applications for determining exact location and identification of barometric altitude of airplanes. Moreover, the usage of multiple transponders in commercial airplanes for backup to the operational modules will further accelerate the market demand in the projected timeframe. In 2018, helicopters accounted for over 18% in aircraft communication system market share with its use for communication with the ground control stations. Multiple benefits including vertical landing and take-off operations, ability to manoeuvre over short distance, and landing in rough terrain conditions are enhancing the rotorcraft fleets thereby supporting the product demand. Spacecrafts are expected to witness a significant growth owing to increasing space exploration activities across the globe. Moreover, rising adoption of satellite navigation systems including GPS, GLONASS, and Galileo systems for avionic applications will further expand the industry size. Military aircrafts will witness steady growth owing to increasing military expenditure along with multiple government initiatives for upgrading existing and ageing airplane. For instance, in February 2018, the U.S. Air Force announced to increase the aircraft procurement budget by over 5.5% in 2019. Further, installation of advanced and light weight components to enhance performance will propel the product demand. OEM dominates the aircraft communication system market with its installation to ensure uninterrupted communication between pilots and air traffic control tower. Industry players are establishing long term supply agreements with the aircraft OEMs for offering a continuous supply of components during aircraft production, thereby playing a significant role in increased revenue generation over the forecast timeframe. Aftermarket aircraft communication system market will witness strong growth owing to the maintenance, repair, and overhaul requirement during service life. Moreover, ongoing upgradation and replacement of existing components with technologically advanced systems will provide a positive outlook for the segment growth. 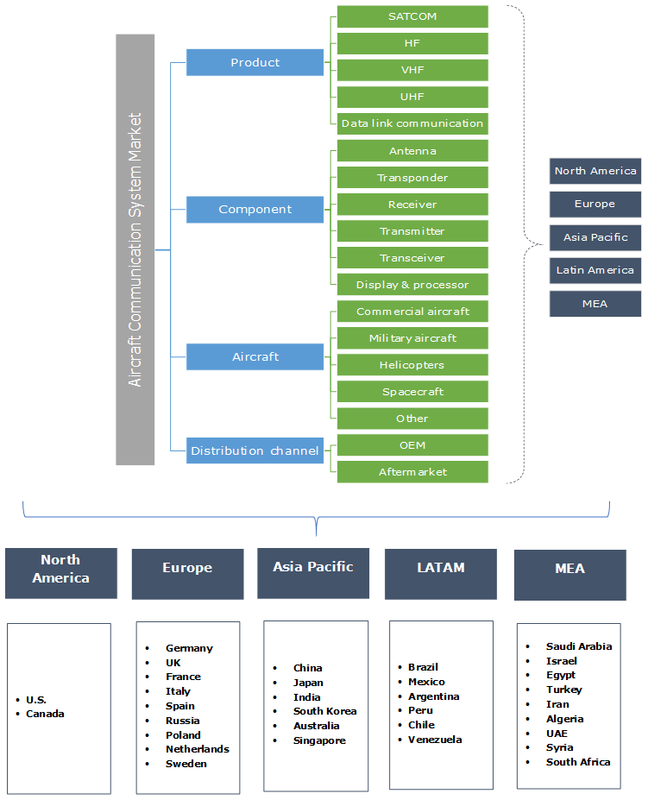 North America leads the aircraft communication system marketplace owing to the existence of multiple airplane manufacturers. Component manufacturers are entering into strategic partnerships and agreements with aviation industry players to ensure continuous supply of components. For instance, in March 2017, Harris Corporation and Avtec Inc. entered into a strategic partnership for offering innovative Digital Mobile Radio (DMR) technology. Asia Pacific, led by China, India, and Japan is expected to witness strong growth over the forecast timeframe with proliferating demand for commercial airplanes along with increasing air passenger traffic. Continuous technological advancements in aircraft communication systems along with lowering of system weight and improving efficiency for supporting the flight efficiency will further fuel the industry demand. Some of the major market players include Honeywell, Viasat, UTC, Ducommun Incorporated, Thales, Harris, and Rockwell Collins. Establishing long term supply contracts for specific airplane models, designing customized low latency solutions for military and commercial airplanes are the key strategies adopted. Manufacturers are investing in R&D to develop solutions that will provide them leverage over the other industry competitors in providing economical and innovative technologies further stimulating the market by 2025. For instance, in 2016, Thales and the UK Government announced a collaborative investment of around USD 25 million for developing next generation communication systems. This has helped the company for product improvements and influenced the aircraft communication system market growth. Stringent government regulations pertaining to airplane communications are positively influencing the aircraft communication system market growth over the projected timeframe. Regulatory bodies including the FAA mandates the inspection and replacement along with maintaining and overhauling of the communication systems after definitive flight cycle, thereby supporting the industry share over the study timeframe. Federal Aviation Authority (FAA) and Civil Aviation Safety Authority (CASA) are the major regulators that govern the market and provide instruction for its installation, working and maintenance supporting the market demand by 2025.